Thanks to all of you for your wonderful well wishes and welcome home's! We had a marvelous time at camp, and have all come back feeling much lighter. For those of you that asked, the beautiful log cabin that we stayed at is the one my parents have been building--all from trees on their lot, cut, milled and built themselves. Amazing work, and so, so beautiful. It's on a wooded 40 acre lot on a very remote lake--we usually go up there for a week without seeing another person. This week was full of kayaking, sailing in that super fun "homemade" sailboat, great bass fishing from Calvin, and visiting with family. If only the location weren't so remote, I'd spend so much more of our summer there! 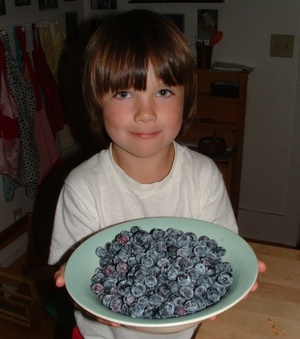 We arrived home in time for Calvin to discover that our blueberry bushes had completely gone wild! Yay!! Blueberry season in Maine!! And it looks like a really good crop this year, too. So...blueberry pancakes for breakfast today, and let's see...blueberry crisp for dessert! Yum!! 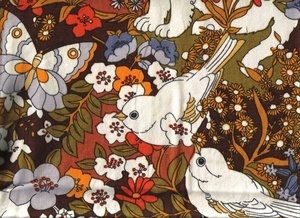 And waiting for me in the mailbox upon arriving home was this lovely vintage fabric I bought on Ebay. I had planned to use this as a new diaper bag, but the print is a bit bigger than I thought, so that might need to be rethought. I uploaded this image into the Flickr vintage fabric group that Hillary started. It's taken me forever to get the time to figure out Flickr, and I still don't think I've explored it fully, but atleast I've started! Now that we're unpacked from camp and are in the final weeks of baby preparation, I need to get crafting for baby! On the (very optimistic) agenda are finishing the baby quilt I started ages ago, making some cloth pads for mama and burp cloths and bibs for babe, sewing a new baby carrier like this one, and finish knitting the Wild Stripes baby blanket. I'm afraid that this list means that I won't get around to a sock monkey or more sadly for me, a pink lemonade apron. Instead, I'll have to live vicariously through all of the wonderful submissions I see popping up everywhere in blogland! !